Here let's introduce the "Finca La Flor Community" ! Brigitte is the founder and general director of the farm. She is involved in and knowledgable about all parts of the community. "Bri" has a background in social work, having lived in Cuba and Guatemala to represent people in need during violent times. 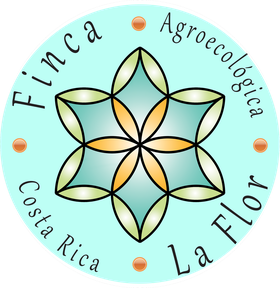 She came to Costa Rica searching for peace and found the beautiful plot of land which she developed into the community now known as Finca Agroecologica La Flor. When Bri bought the land, it was mostly cow pasture. Passionate about having a positive impact on the environment, she reforested 20 acres and has maintained trails for everyone to enjoy. The remainder of the property has been dedicated to forming a community with a local focus. Her vision has steered the community to practice organic agriculture, use medicinal plants before going to the doctor, and maintain a diverse ecosystem for the benefit of all residents and visitors. Lara loves nature, movement and living in community. She is Contemporary, Contact- Impro and Taekwondo teacher in our beautiful arts center. Lara is also very interested in somatic education and facilitates grupal sessions of Feldenkrais® (ATM - ("Awareness Through Movement") for our volunteers and guests. Jeff is focused on bringing permaculture principles to our community. He spends time maintaining the gardens, organizing volunteers, and integrating sustainability into the farm. He is a Professional Engineer with emphasis in renewable energy, mechanical and electrical systems. Eberhard is a graduated engineer for horticulture with a specialization of botany. He dedicates to the production of organic vegetables and is a passionate chef who enjoys introducing our farm's fresh produce into a healthy and delicious diet. As a specialist of orchids he is also working on pollination biology and systematic issues of this plant family. Also cultivating the orchid collection of the finca. He loves to spend as much time as possible in the forest and presenting guests and friends the ecosystems of Costa Rica with its animals and plants as a nature guide. Mauricio Guerrero, an environmental engineer, and his wife Christine Bennett, a wound specialist nurse; after many years of hard work, decided for their retirement to look for an environment to experience the joy of nature and the peace of silence. They chose the mountains of Costa Rica and they created Finca “Estacion Descansos” as a station to relax your mind and body and renew energies to continue walking on your life path. Mauricio and Christine are part to the community “Finca La Flor” dedicating their time to strengthening human and environmental consciousness. Roxana has an infectiously happy attitude and prepares delicious, vegetarian meals. She keeps our shared kitchen clean and welcoming. Humberto is the man who has taken care of the forest for these 20 years. He has created and maintained trails so people can enjoy the thriving environment. He guides visitors in hikes and he loves sharing all his knowledge after years of observing nature, telling his stories with a great sense of humor. Martha is our spanish teacher with many years of experiences. She teaches in a lively manner and introduces the students to the daily life and the culture of Costa Rica. One of the farm's most charming employees. And many more ! Come and meet them all.